Egg freezing is a breakthrough technology that allows women to freeze and store their eggs indefinitely. Once a pregnancy is desired, the eggs can be thawed, fertilized and placed within the uterus in order to initiate a pregnancy. What is the Cryopreservation of Embryos? Couples who undergo IVF often fertilize multiple eggs at the same time. 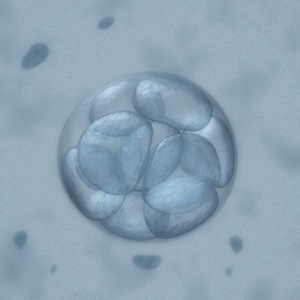 After an embryo transfer, extra embryos may be cryopreserved (frozen) for future use. Cryopreservation makes future fertility treatment cycles simpler, less expensive, and less invasive than the initial IVF cycle, since a frozen cycle does not require ovarian stimulation or egg retrieval. Once frozen, embryos may be stored for many years. Couples should decide if they are going to cryopreserve extra embryos before undergoing IVF. Who Could Benefit from Egg Freezing? Women who wish to delay the "biological clock"
First, women take a medication called gonadotropin. This medication stimulates the ovaries to produce several eggs. These eggs are then collected from the ovaries using a minor surgical technique known as transvaginal oocyte retrieval. This procedure is performed under light anesthesia, and no incision is required. Eggs are then vitrified-- rapidly cooled and frozen in liquid nitrogen for long-term storage. Vitrification comes from the Latin meaning "to turn into glass." It is the process by which eggs are rapidly cooled. This prevents the formation of ice crystals within the egg. Ice crystals need to be avoided as they often damage the egg when it is subsequently thawed. The resulting frozen egg looks glass-like, hence the term "vitrification." While this technology is relatively new, recent studies have been reassuring. There is no evidence of an increase in risk to a baby that results from an egg that was previously frozen. In one study of 200 children born following egg freezing, the rate of birth defects (3.5%) was no higher than the rate found in the general population. In Illinois, many insurance policies cover fertility treatments. Unfortunately, egg freezing is generally not covered. A typical cycle costs approximately $7000. There are additional fees for medication costs and long-term egg storage fees. How Long Can Eggs be Frozen? Once the eggs are frozen, they are essentially in a state of "suspended animation." They do not age. As far as we know, there is no limit to the length of time eggs may remain in storage and still be viable. When Does a Woman's Fertility Begin to Decline? Fertility begins to decline in the late 20's. This decline is relatively slow until approximately age 35. By age 38, the rate of fertility loss begins to accelerate, and continues to do so until the mid 40's, when the chance of pregnancy declines significantly. How Does Egg Freezing "Beat" the Biological Clock? The risk of birth defects, such as Down's Syndrome, increase as a woman ages. Freezing eggs allows a woman to "put the brakes" on the risk of such birth defects, because frozen eggs are suspended at the age of the woman at the time the eggs were removed and preserved. While a woman may return years later to use her frozen eggs, there will be no increase in risk to the resulting baby, as these eggs have been "suspended" at that younger age. Who Can I Talk to About Egg Freezing? Our board-certified reproductive endocrinologists can help you explore your fertility preservation options, including egg freezing. Schedule an appointment at one of our four Chicago-area clinics today!